Me. Doing what I do. And now you're probably wondering why on earth I'm blogging about blogging. My blog is a series of short stories about growing up. Huh. Me. Growing up. Most people think it didn't happen. Couldn't happen. Will never . . . but I digress . . . Occasionally, I feel guilty about spending such a lot of time with my beloved blog. Even entertain the thought of abandoning it. But then, someone tells me to continue. Usually this is a reader (I do have them . . .). Or a person who has read a particularly amusing tale (true story). But sometimes, it is someone . . . OFFICIAL (dun, dun, duuunnn!). The first was my publisher, Cedar Fort. Imagine my joy . . . "Diane, get your name out there. Blog. Get people reading your blog." It's like being told, firmly, to "Eat that chocolate! All of it. Don't miss a bite! Oh, and lick the wrapper when you are done!" 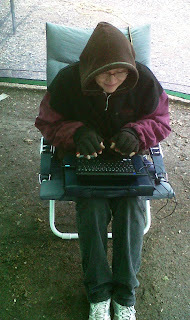 I scurried to obey, frantically typing little stories and posting them. Then telling everyone in Facebook, Twitter, Linked In, Google . . . you get the picture . . .
Then, another magical day. I was sitting in Church ( I do that sometimes) and our Stake President was speaking. And what pithy, uplifting theme did he choose to advocate? It was from the pulpit. His exact words were, "I encourage you to blog. Blog. Blog. Blog. People are reading your stories. They are making a difference." Okay, I know that there were many, many people in the congregation, but I'm sure he was talking to me. That made it official. With a capital OH! And good enough for an elbow in my husband's ribs and a hearty "Ha! Told you so!" So, admit it, you're convinced. Blogging is what you want to do. Now, how to do it? First, choose an amazing topic.For example, what do you most enjoy reading or hearing about?Surprise! That's what your blog should cover.That was easy.So now you are writing a world-class blog. How do you get to be, for want of a better term, better?Be entertaining. Be unexpected. Be humorous. Be inventive. Be courageous.Okay, yes, also be honest.Then get yourself known.How?Well, you could do something outrageous.But, trust me, that just creates more problems.I know.Really.Moving on . . .The best way is to blog every day. Get your name out there every day. Post every day. (Have I said 'every day' too much? )And read other blogs.Comment.Their authors will follow you back.In a non-creepy way, of course.And before you know it, your readership has gone from zero to sixty to six hundred to . . . you understand. What do you do when scary things happen? What if you’re a child? Now there is a beautiful new book by Christy Monson and Lori Nawyn that addresses this issue. 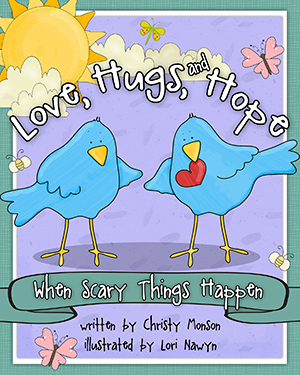 With bright, colourful pictures by Nawyn and simple, engaging text by Monson, Love, Hugs and Hope: When Scary Things Happen, is a blueprint of what to do when you’re little. And frightened by something terrifying. In a world increasingly shattered by violence, mistrust and hatred, Love, Hugs and Hope is a bright little spot of warmth. A much-needed resource; its easy-to-follow, sympathetic advice and charming pictures will make it a go-to book for generations. I loved this book! Thank you to Monson and Nawyn for giving us a simple balm for the truly frightening events of our day. Written after the tragic shooting in Newtown, Connecticut, Love, Hugs, and Hope: When Scary Things Happen is an invaluable tool for helping children identify feelings that overwhelm them with anxiety and despair. Author Christy Monson guides readers through emotions of fear, sadness, and anger, then lends constructive and practical ideas for how to manage such feelings and seek comfort. Lori Nawyn’s engaging illustrations help young children understand that hope is only a hug away. How did you meet Lori? How did your collaboration work? Lori Nawyn did the art and I wrote the script for this picture book, Love Hugs and Hope, and we are both very happy about it. However, we didn't start out to work together. Lori and I knew each other from a couple of SCBWI Conferences. We had formed a picture book critique group that met each month so we were friends. But it was the publisher that teamed us up. Lori is a darling, and I love her art. We never collaborated on the book at all. I turned in the manuscript and Lori and the publishers did the rest. I have been writing about 7 years and loving every minute of it. Do you have children? If so, did you draw on your own experience as a mother in writing this book? My experience as a mom has really helped me in writing this book. Children just need to talk things out a lot of times. They want love and reassurance. You're a retired family counselor. How did your training and/or years of practice help you with this book? I kind of had a sense about how to process with kids from being a mom, but my training as a therapist really gave me the knowledge I needed to help children heal. In my practice I saw a lot of kids that were dealing with tragedy of some kind or another. Talk therapy is good for kids, but art is a wonderful way for them to release feelings. How long did this book take to create? It took me about a week to write the first draft of this manuscript. I felt so sad for those who had experienced loss in the school shooting at Sandy Hook. Shortly after that a gunman shot up the Clackamas Towne Center in Oregon. Our daughter, son-in-law, and two granddaughters live about three miles from the center. The parents monitored the events carefully, but turned off all media to protect the kids from knowing about it. However, the next day at school the children were all talking about it, so you can't protect children from knowing about tragedies like this. As I thought about these two catastrophes, I felt something needed to be written to help parents and children look at disasters like these, be able to share their feelings, and find hope in the world around them. Do you have other book ideas along the lines of children's self-help/picture books? I love writing picture books. I have many other book ideas I'm thinking about, but right now I'm focused on a series about children's feelings. How did you find a publisher for the book? I am so fortunate to have found my publisher, Christopher Robbins, and Familius. At LDS Storymakers Boot Camp, Rick Walton was conducting out picture book section. He began talking about Familius and what a great new company it was. When he found out I was a retired therapist, he suggested I contact Familius, and I'm so happy I did. It was the most exciting, amazing, stupendous, thrilling, exhilarating, stirring, electrifying, sensational thing! Okay, I admit that I lived in the middle of the prairie, at the back of beyond, just past the end of the road, and not quite to that part on the map where it says ‘Here be Dragons’. Oh, yes. Exciting, amazing, (see above) . . . The mail at the ranch came whenever someone drove into the nearest town, Milk River, and picked it up. Sooo . . . intermittently. Whenever Dad would appear with an armload of envelopes and dunners and fliers, I would always be first in line to greet him. Me: Dad! Anything for me? As time went by, I got smarter and learned to circumvent his inevitable question and get directly to the disappointment . . .
Me: Dad! Anything for me? My name’s Diane! Then my friend, Kathy, pointed out the amazing, stupendous (see above, again) activity. She was looking through a magazine on the school bus on the way home from school and pointed out the rows and rows (and rows) of offers listed in the back few pages. She told me that most magazines had the same listings and that if you sent requests, the advertisers would send you . . . get this . . . free stuff! What could possibly be better than that?! When we got home that night, I dove into the stack of magazines that inevitably accompanied Dad’s comfy chair in the front room. Wow! The Western Horseman was loaded! Even the Canadian Veterinary Journal hosted pages and pages of . . . stuff! For the next few evenings, I was happily closeted with one or more magazines, carefully writing out my requests and enclosing them in their handy-dandy envelopes. Then I raided Dad’s desk for stamps – would you believe that it only cost four cents to mail an envelope back then? 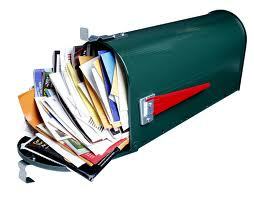 – and handed the pile to my dad for mailing during the next town run. Finally . . . it happened. Dad (just slightly surprised): Yes. This came for you! For months, I got catalogues, pictures, pens, trinkets, the occasional poster and several hair-grooming necessities. I finally lost interest in the searching and requesting. Though I never tired of the receiving. But the one never happened without the other. Moving forward several decades . . . Yesterday my daughter came in from getting the mail. Me: Oooo, mail! Anything for me? Daughter: Yeah, there’s a package here for you. Labels: What could be better? Once more, Delores has delivered. Once more, we put pen to paper. And take a trip through history. Upon the headstones, lost in time. Called from embraces firm and strong. With courage and with faith so strong. The best friends anyone could wish. Oh, there’s the Grandpa of the clan. Some unknown and some with fame. It’s written there for all to see. What will someone say ‘bout me? Labels: What will they say about you? The ranch house. Warm. Comfortable. A little too welcoming. It was evening. Just before bedtime. And my dog, Cheetah, was barking. Something she did a lot. We had tried to train her out of it, but had never quite succeeded. It was . . . annoying. Finally, I set my book down and got up to see what could be bothering her. Coyotes howling in the foothills nearby? Water running in the canal? I should explain, here, that the Stringam ranch house had a large carport with two walls: one on the west, formed by a wall of the house and one on the north. The south and east sides were open. The carport joined the overhang over the front door in a narrow strip right next to the house. It was possible to walk from a vehicle into the house without seeing the sky, but it was tricky and involved negotiating car hoods and garden paraphernalia (good word). Now, normally, when one exited the house, one would walk straight to the front gate and avoid the carport entirely. Tonight I . . . didn't. I glanced out the door into the inky blackness. There is nothing quite so dark as as a night on the prairies, with no moon. And the mercury vapour light in the yard not quite reaching the house. My dog was over in that yard, at the business end of the carport. Still barking her fool head off. I sighed and pushed the screen door open. And did something I had never done before. I turned and made my way, carefully, to the carport, avoiding shovels and other neatly-placed garden tools. Then I walked between the cars toward my frantic dog. I paused at the edge of the carport. Cheetah was just feet away and her barking, if it could be believed, had increased. I could see her clearly now, even in the dim light. Hackles raised. Whole body stiff with intent. I started forward again, but just as I lifted my foot, a sound shattered the darkness. And I do mean shattered. It was the scream of a cougar. Now, I'm sure I don't have to tell you what the sound of a cougar does to one when you hear it ringing across the prairie. 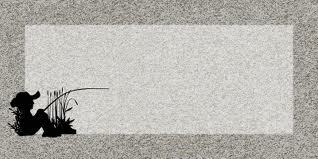 It's . . . scary. This scream was five feet away. At the very edge of the carport roof. Then started to back up, one step at a time. Finally, I turned and sprinted towards the front door, careful to keep roof between me and our unwanted visitor and heedless of whatever might be in my path. I called my dog and she came running. The two of us ducked inside, and I banged the heavy outer door shut and locked it. I was staring out the window. Cheetah was now standing behind me. She continued to bark. “We have a visitor, Mom!” I said over the noise. “Oh?” Mom appeared in the kitchen doorway. I stayed by the window, but could see nothing in the blackness. My dad appeared. Calm as always. Dad got a flash-light and pointed it out the window. The roof was snared in a noose of light. I cautiously opened the door. Cheetah shot through and into the night. Her barking moved slowly away from the ranch buildings and toward the foothills. Our visitor was obviously headed home. Everyone present heaved a sigh of relief. With some visitors, that's just the way it is. I will add that this was the first and only time I can remember a living creature receiving a less-than-exemplary welcome at the ranch. And not being offered a warm meal. Oh . . . wait. And frolic with the bears and deer. When finally, the time was here. Would charge together through the trees. And ‘Find the Flag’ and all the rest. To spend a moment round the flames. And plan for the tomorrow games. And watch their progress through the trees. On fleetest feet; or hands and knees. Time’s gone by. It’s what it does. 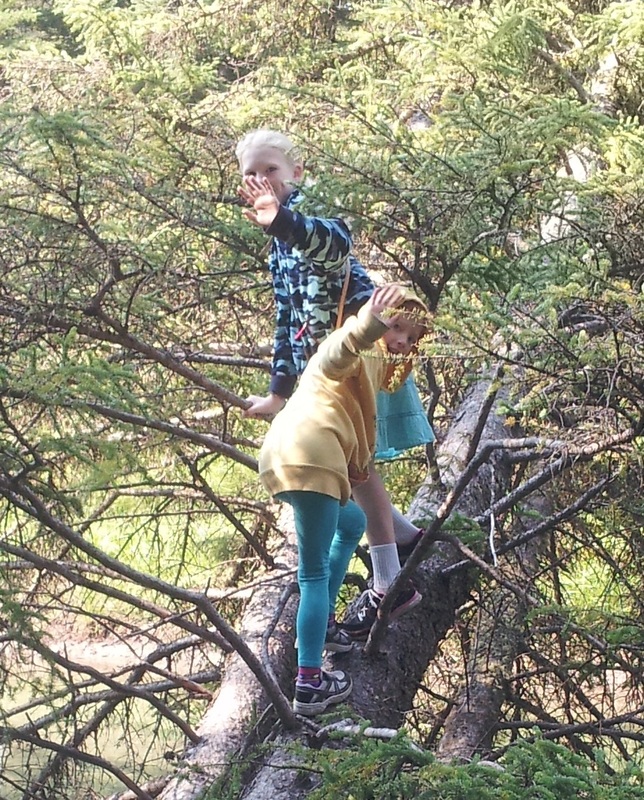 And still we’re camping in the trees. There’s silence floating on the breeze. Like eat and nap and swim and fish. And talk about the times long past. And summer days forever last. But now our kids are raising theirs. A priority that’s far behind. When simple fun brought endless joy. Who's Afraid of the Big, Bad Hill? A guest post by Steven Clark. 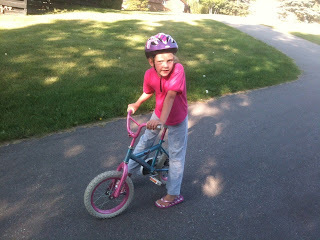 My oldest daughter has cultivated a new passion this summer: riding her bike. As a bicycle commuter, I could not be a happier father than to have my girl be as enthused about cycling as I am. Every opportunity she has to ride, she'll take it. I used to ride my bike with her, but found that I could keep up with her just as well by walking. Earlier in the season, she did quite a bit of walking over riding because she had a paralyzing fear of hills. Didn't matter if the hill was a steep grade or slight enough to barely get a marble rolling on its own, she had to walk down. 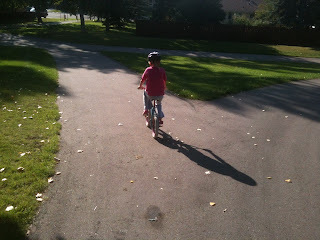 After a couple days of this, I went over braking with her and then encouraged her to try braking to slow her descent. She still persisted in walking down hills. 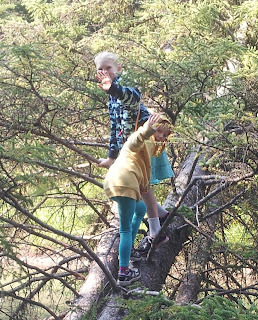 Before I chided her disbelief in her own abilities, I remembered someone else who had trouble with hills: my sister. Summer of '86 or so. We were living in Petawawa, Ontario at the time and bikes were our vehicles of independence. Wherever we wanted to go, we went. One of the destinations of choice was Petawawa Beach, renamed Black Bear Beach. For some odd reason, whenever we went there, there was never a lifeguard, which added an element of adventure, but the ride there was what made me think of my daughter. Comparing my memory to Google Maps, the final turn to get to Petawawa - sorry, Black Bear - Beach went down a fairly steep hill. The adventurous - and scary - part was close to the bottom of the hill where the road transitioned from paved to gravel. My step brother and I had no problem getting down the hill. We just alternated between coasting and braking, never letting our speed get much beyond a crawl. My sister went much quicker, and not because she was a daredevil with a death wish, but simply because she was frightened and froze up. In retrospect, I'm surprised she survived since this was the time before bicycle helmets were common and mandatory for youth. As my sister put it when I asked her about the experience, she only remembered going down the hill and then waking up in the hospital. My sister made a full recovery, and soon we were off to the beach again. She zoomed past me at the bottom of the hill and I realized her biggest mistake. Closing her eyes when she got scared. This led to another crash, but not quite as spectacular as the first. My memory may be faint, but I don't remember any other bicycle excursions to the beach. I seem to recall we went with my parents every time afterwards. After this recollection of blood and dust, I figured it would be best to let my daughter take hills at her own pace, and not push her to ride down them regardless of the grade. I am happy to report that my girl now delights in riding down small hills, but still dismounts for steep ones. And she has never been to the hospital for any of her crashes. Labels: A guest post by Son-in-Law Steven Clark. You see misfortune. We saw 'scary'! There was a haunted house in Milk River. You name it. If it was slimy and scary, it had a residence in that house. We children in the town skipped past on the far side of the street. With our ears plugged and talking volubly, so as to drown out any and all noises that might escape that house. Even so I'm sure that, on two occasions, I heard screams. And no, they didn't come from me. At one time, Milk River's haunted house had been just another normal, ordinary, rather elderly little home. Situated about half-way down the block. A family had lived there. But that was where the 'normal' part ended. At least that is what my friends had informed me. One night, the mother had asked her little boy to go down into the cellar to look for the family cat. It was dark in the cellar. He had lighted a match to see more clearly. And dropped it into a vat of kerosene. What that was and why a vat of it would be sitting in someone's basement, I didn't know, but it sounded dangerous. Suffice it to say that my facts really didn't hold well under scrutiny. I was too busy shivering in delight. So the little boy dropped his match into the vat of kerosene. It lit up like a huge torch. He and his family barely got out alive. No one knows what happened to the cat. Actually, none of us really knew what happened to start the fire. It was just one of those terribly unfortunate things. The family moved away, maybe to a family member's house to regroup. But reality wasn't as interesting to us kids as the stories we made up. Once, a group of us actually sneaked into the house and got as far as the kitchen. Standing in the center of the room was a partially-charred table, still covered with an equally-burned oilcloth and decorated with a bowl of blackened fake fruit. And ran from the house screaming. I know, I know, intrepid explorers we weren't. 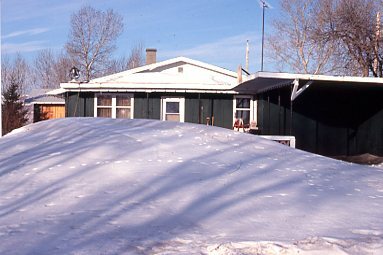 The house was eventually demolished. Mainly to keep us kids from scrambling through it like some sort of ride in a carnival. 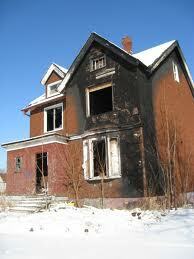 But even after another house had been erected and another family moved in, it remained the haunted house. And maybe they're there still. Making noises and screaming at odd hours. The four-year-olds in the neighbourhood would know.